One of the reasons I like collecting, at least when coming into it late in the game, is that it is like going on a treasure hunt. To gather releases as they happen is satisfying, but discovering ornaments from Asia in years past that were not known to US collectors, to find them and add them to my collection, has been really fun. In addition to the joy of detective work, I have also made some online friendships with people all over the world. Most recently I acquired a set that released in China back in 2009. A US collector informed me it was produced, but to find it was very difficult. When it arrives I will post pictures. That brings my collection to just 7 ornaments shy of complete! 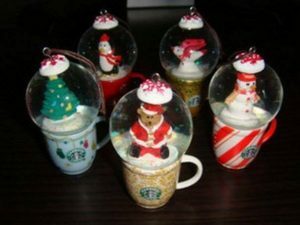 There are some “Also Ornaments” I still need as well. They are the 2014 Iron Chocolate Balls, candy tins from Asia. 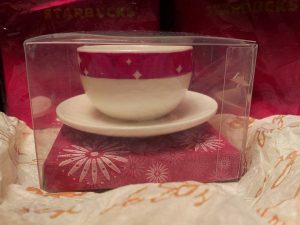 The 2006 Cup and Saucer released in Japan.